that is awesome! i did not know about this...way to go NIKE. thanks for sharing this. This is wonderful, I had no idea! Now, for everyone who reads this, remember the info is archived in my sidebar so it can be retrieved next month when You ask yourself.."Now what was that about recycling shoes?" Thank you so much for sharing this info today with us. Shoes? Who would have thought? I just think it's great. Now who would have thought that all these worn out old sneakers, that I have been tossing in the trash could be of value to someone other than the dump? I am so thrilled sweetie. What a beautiful share ofcourse, and I will be gathering up my group and finding a drop off place. Surely they have one here in Phoenix somewhere. Thank you for the wonderful informative post. I so enjoyed myself today. I hope you have a beautiful Wednesday sweetie. I had no idea Nike did this. This is brilliant! I'll keep checking in to find out when they open a location in Southern Ontario Canada! What a brilliant idea! Thanks for calling this to our attention. My son's soccer field has a base of ground rubber under the grass. It is amazing how this "new" surface seems to reduce the number of injuries. had no idea of this program..
for sure I'll be taking mine in..
but my others have been relegated for outdoor use..and are nearing their end of useful life span..
thanks for the very useful tip.. I had no idea Nike did this, how wonderful!! I have a pair now thats on its way out. I try hard to recycle as much as I can. We were away and just got back, I missed your posts and I'm glad to be back home and back to blogging!! Thank you for your nice comments on my 'Magdalena Stories' it means a lot to me!! I knew that they recycled shoes but I tend to hang on to running shoes for 5 years or so. Nice to be reminded. This is good news that I was unaware of. It does my heart good to hear a large corporation saying they want to reduce their carbon footprint, then doing something about it. Thank you so much for this - there IS hope!!!!!!!!! I'll have to remember this. What a great idea! I tried to call you earlier and couldn't reach you. I have been down in Central FL at a funeral of a close friend. Mr. Magpie is slated for kidney surgery next week. It's been a wild ride of late. But seriously.. it's good to see Nike doing their bit... Those created the consumer products also dealing with the reusability!!! Very informative post. I didnt know that they could recycle shoes.. Pretty great! More recycling is definitely the future!!! Happy weekend and Labor Day, dear Shellbelle!!!!! I did not know about this. I recycle but never thought about recycling my shoes. I will definitely add that to my list. I can probably get my sons' friends to give me their nasty shoes. Yeah, that bin will definitely stay outside! 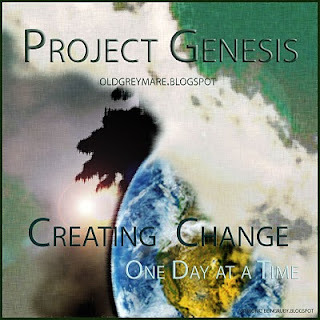 I also need to check out Project Genesis as it sounds like something right up my alley. This is awesome. Unfortunately there doesn't seem to be a drop-off location anywhere near me but I'll keep on the lookout. I believe in helping our environment as much as possible. I don't really like NIKE but this makes me feel better about them. I hate how they pay soooooo much $$$$ to athletest like Tiger Woods just to wear their logo. I think it's ridiculous how much some of those professional athletes make. But that's my soapbox, and I'll step down now!